Morgan is a creative girl who thrives on one-on-one attention from caring adults. She prefers to interact with peers younger than her and benefits from having an adult close by to redirect her and help her out when needed. She finds joy in animals and loves to interact with them, especially cats and dogs. Other activities she enjoys are arts and crafts, swimming, playing with her baby dolls, and building with her Legos. Morgan is working on developing and using behavioral strategies and tools to assist her in managing her feelings and moods. Cognitively and socially younger than her chronological age, Morgan has a special school program that addresses her specific needs. Teachers and caregivers are most helpful to Morgan when they use simple, concrete words that she can readily understand to compensate for the difficulty she often has in understanding certain concepts and situations. Though she is making progress, Morgan will need her adoptive family’s support with her daily living/life skills. It’s likely she will need assistance throughout adulthood. Morgan can be impulsive, so it’s important that she has a proactive family that can anticipate temptations and responds in a nonreactive manner. She would likely respond well to a highly nurturing family who is able to be direct, firm, and consistent. Adoptive parent(s) that have a very well structured home environment, a consistent daily routine, clear expectations and limits, and logical consequences would be best for Morgan. Having a good repertoire of behavioral tools and strategies will likely prove to be very useful in helping Morgan realize her full potential. 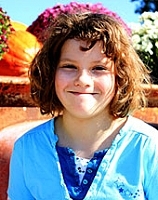 Morgan has expressed she would like a family with lots of animals, electronics, and a mom and dad.